Cooks, drains, serves and stores. Cooking pasta can be a hassle. The amazing pasta boat makes it faster and easier to make perfect pasta every time right in your microwave oven. It's soooo easy. Just put in the pasta, add water to the serving line, then pop it in the microwave. It's that easy. Pasta boat keeps water at the perfect temperature- it actually does a better job than a pot on a stove. When finished, place on the strainer lid, drain out the water and you're ready to serve. The stay-cool handles are also designed to measure portion sizes of spaghetti and the steamer rack can be used to steam potatoes or vegetables right in your microwave. Pasta boat is one of the most useful cooking products you'll ever own. Take yours home today. Just put your pasta, add suggested water, and put in the microwave. With this microwave pasta boat, home cooks and professional caterers alike save on both preparations and cleaning. 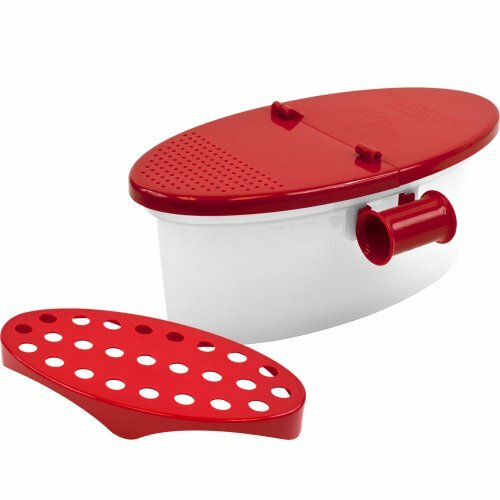 You can also use it as a colander/strainer/drainer. Please look for US trademark brand [Time Roaming] before you buy. If you have any questions about this product by Time Roaming, contact us by completing and submitting the form below. If you are looking for a specif part number, please include it with your message.